I think you're confusing this with OE Integration. 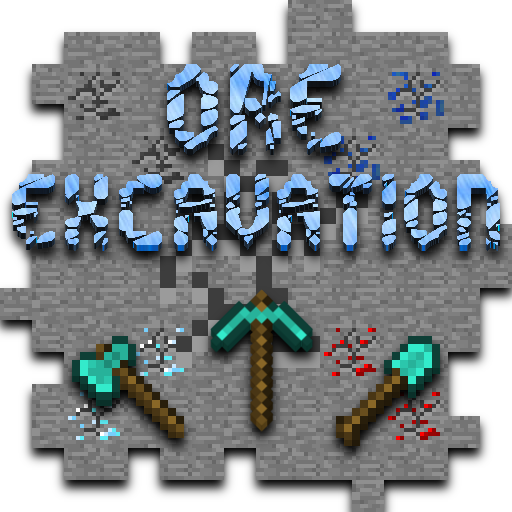 Ore Excavation by default doesn't have any enchantment or modifier requirements to use it. If you think the release version is crazy, you should see what shenanigans I get up to in dev stress testing this. Mountains BE GONE! Also fun turning off the block type limitations and excavating oceans making servers cry dealing with fluid updates. the newest version is kinda.. weird, cuz the limit of only mining 5x5 areas. and i was mostly using this mod insted of vein miner cuz you can mine other blocks too. Sounds like you have shape mining toggled on. The only thing I changed in the last version was adding gamestage support. Not sure what you mean about not being able to break blocks behind another block though. Is it possible to configure this so that, for example, axes can't excavate dirt? It would be nice if you had to use a matching tool to excavate blocks even if you can technically break them by hand. I read the config files and couldn't come up with a way to do this. There are configs to enable proper tool requirements if you want that behaviour. The reason it works by default is because dirt doesn't necessarily need a tool in the first place to harvest, even open hand would work. I tried the "alternate tool check" config option but it didn't restrict dirt to shovels. I don't think there's a setting that does what I want. What am I missing? Are you able to adjust the settings so that it takes longer to mine the block if you are trying to cut down a whole tree/ mine a whole pocket of ore? You can do tool specific overrides for speed an max harvest count but not based on specific blocks that tool is harvesting (there would be some conflict between the overrides if I did both). Do keep in mind that the speed is in blocks per tick so the slowest you can make it is 1:1 (i.e. 20 blocks a second). Is there an option to use wildcards when defining tool/block. Example if I wanted to use all the Actually additions' paxels. Or do I have to add each one manually? You can't use wildcards or partial names to cover multiple tools with separate IDs but you can use ore dictionary names if there's one that covers that tool type such as "paxel". Any chance you could update this mod to include game stages API? I'm considering it but only if I can set it up as a soft dependency so people who aren't interested in using it don't have to install GameStages. Thankfully I've made OE pretty flexible to have its behaviour modified externally so making it work without ripping up perfectly good existing code hopefully wont be an issue. Added native support in build 1.4.119 so give that a try once Curse approves it. Hey, so I'm playing GWSheridan's Lost Souls modpack, which features Ore Excavation. I can't seem to get it to work, however. I've tried changing the keybind to [F4] because it was free, but I still cannot mine veins of material at once. I am kind of a noob with the technical stuff behind mods, so it could be possible that I messed up Ore Excavation in my instance. The pack may have configured additional tool restrictions on its use through the configs or other integration mods. If you're absolutely sure that your keybinds and tools are correct for using OE, you'll have to ask someone familiar with the pack to know how it is configured to work in there. Can you please explain what strictsubtypes does in the oreexcavation_groups.json file?